Brilliant. Glover Teixeira is no joke. 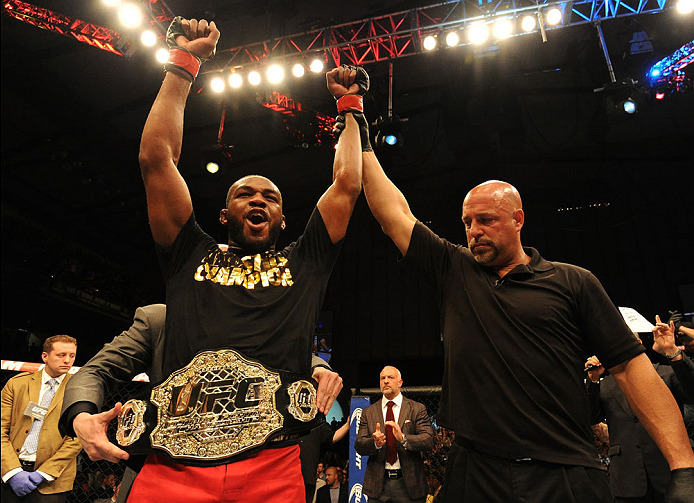 He’s the real deal and was a legitimate contender and threat to Jones’ title reign in the UFC 172 main event. Unfortunately, Jones did what he’s done to so many top-level foes – he made him look ordinary. Yet what impressed me about Jones’ effort isn’t that he dominated Teixeira, but the way he did it. He didn’t take Teixeira down for five rounds and ground and pound him, but he stood in the pocket at close range and beat him while giving Teixeira every chance to turn the fight around. If the Brazilian was going to win, he was going to do it by landing a bomb and following up. And Jones stood right in front of him. But Bones’ defense was tight, and when it wasn’t his chin didn’t abandon him. Also key to note is that Jones’ approach to the game appears to have little clusters of old school sprinkled in because this guy makes every fight just that, a fight. Yeah, he’s got a mean streak, whether it was frustrating Teixeira by putting his hand on his forehead, throwing bad-intentioned elbows, or just treating this like a game of “it’s me or him,” and Jones wasn’t about to let it be Teixeira. We all knew Anthony Johnson was good. He wouldn’t have had such a long previous run in the Octagon if he wasn’t, and the six-fight winning streak he sported going into Saturday’s co-main event against Phil Davis was nothing to dismiss either. But in what was a signature performance by “Rumble,” the Georgia native was on another level when it came to his technique, poise, and ability to control everything about a 15-minute fight. It was a master class by a new player in the UFC’s 205-pound weight class, and after all the trials and tribulations he’s been through over the years, it’s nice to see him have his day in the sun. As for the guy in the stands behind me yelling for Davis to take Johnson down because “you’re a Division I wrestler and Johnson has no wrestling,” a) He tried and b) Johnson was a junior college national champion, so he’s got some wrestling. He also has knockout power in everything he throws. Put that all together, and he may end up being an interesting matchup for Mr. Jones. I had the pleasure of sitting with a trio of great MMA minds on Saturday afternoon in the form of Fightnomics authors Reed Kuhn and Kelly Crigger and retired UFC vet Aaron Riley, and the topic of the sport and some folks’ perception of it came up. More specifically, the idea of someone who knows nothing about combat sports looking at it and saying “that’s easy; I could do that.” Well, the consensus of our little quartet was “No, you can’t.” And if anyone I know personally ever makes a comment like that, I will quickly show them last weekend’s wins by Luke Rockhold and Jim Miller. Both were brilliant tactical displays by fighters who have been doing this for so long at such a high level that the techniques they use are second nature, thus making it look effortless. But anyone who knows this sport knows that it’s far from easy. For Rockhold to take a takedown attempt from a former Division I wrestler like Tim Boetsch and turn it into a submission win was a stellar show of patience, technique, and know-how. It was the same thing with Miller, who added an array of kicks to his arsenal, and in doing so, opened up a left to the body that then led to the fight-ending submission. So what may look to the outside world as mere good fortune is far from it. At this level of mixed martial arts, there is no luck. Losses hurt no matter what the payday is at the end of the night, so I know Isaac Vallie-Flagg would probably give back his Fight of the Night bonus to have received the nod in his bout with Takanori Gomi, but I don’t think anyone walked away from that lightweight slugfest saying “I don’t want to see that Vallie-Flagg guy again.” And dare I say it, in a career filled with fights I would watch over again, this may have been my favorite from Albuquerque Ike because to me, this captured who he is as a fighter: a gritty, no nonsense, blue collar worker who doesn’t fight when the mood hits him; he fights for 15 minutes or until the referee says stop. You can’t help but root for a guy like that. As for the victor in Saturday’s bout, it was cool to hear the Baltimore Arena crowd chanting for Gomi, the former PRIDE champion, and showing that there is still a reverence for the sport’s greats. Is “The Fireball Kid” the same fighter he was back when he ruled the rings in Japan? No, but he has won three of his last four, with the one loss to Diego Sanchez debatable, and he will produce some interesting matchups with members of the stacked lightweight division. There’s still some heat left in this fire. I don’t know whether it was the enthusiastic crowd, the matchups, or the real arrival of spring, but it just seemed like everyone was getting after it on the UFC 172 card. It was a great night of fights, and a good note to hold on to before the next event in Cincinnati on May 10…Maybe the knockout wins by Chris Beal and Danny Castillo were the catalysts for the crowd getting into this card from the opening bell to the last; I sure know they both got press row hopping…Bethe Correia may the sleeper pick to become a player in the women’s bantamweight division sooner rather than later…Timothy Elliott was just what Joseph Benavidez needed in his first fight since losing to Demetrious Johnson – a fighter who was going to push him into deep waters and make him fight from the time the bell rang. If Benavidez had space to think about his last bout, it may have made him tentative. Elliott didn’t give him that luxury; he forced Benavidez to fight back immediately, and with his submission win, Joe-B-Wan is right back among the flyweight elite…This may have nothing to do with Saturday’s fight, but it is fight week related. We all know that the UFC roster is perhaps the most accessible and fan-friendly in all of sports. This was evident again this past week in Baltimore, and it’s always nice when a fighter or someone related to the UFC is a good guy (or gal). But when they’re cool to your kid, that makes you appreciate them even more, so a public thank you to Rashad Evans, Urijah Faber, Phil Davis, and Mike Goldberg. They don’t have to do what they do, but they do.